©Bert Gildart: (Note: I’m publishing this five days after the fact, as we’ve had no Internet. Others about Natchez and the Natchez Trace will soon follow.) After a horrendous day driving around Houston, Texas, now our candidate for one of the top two cities in the nation to avoid (Chicago, Illinois, used to be our number one nominee, particularly if pulling a travel trailer) we have landed at one of our favorite areas of the country, Natchez, Mississippi, gateway to the Natchez Trace National Parkway. 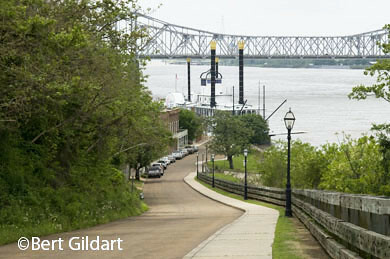 In days of old, Natchez, Mississippi, provided the old rivermen with a jumping off place to return home. Toward the end of the 1700s, farmers living in regions such as Ohio, Pennsylvania, or some other state having eventual river access to the Mississippi River, would load crops and produce onto rafts then float downriver to Natchez or New Orleans. Robert Fulton had not yet invented his steam engine, so the only way back home was to walk, and this developed what soon became our first national road. Today, their feats are celebrated by the Natchez Trace National Parkway, which stretches from Natchez to Nashville-about 450 miles. Popularly known as the Trace, a modern-day rural roadway now parallels the Old Trace and provides an incredible story about these days of old. Along the Trace, Andrew Jackson fought a duel to protect the good name of his wife to be-and Capt Meriwether Lewis died, most thought from suicide. We’ll be in Natchez for a few days, recuperating from our drive around Houston. As well, we’ll be touring some of the beautiful old antebellum homes for which Natchez is so well know. We couldn’t have arrived at a better time as the area is now celebrating what it calls its Natchez Spring Pilgrimage. For about a month, the town’s antebellum homes will be open for tours, allowing the curious to see how Southern gentry lived when cotton was king. Natchez and the Natchez Trace has been good to Janie and me. About 10 years ago, we gathered much material and took many photographs and assembled it all into a book published by FarCountry Press in cooperation with the National Park Service. The book is still for sale in many outlets and has done well for us. While here, and while traveling the Trace, we’ll be looking for new images to upgrade our book in another year or two. As we linger, we’re camped in our Airstream along the Mississippi River, learning once again that although life has changed drastically since the days of Scarlet O’Hara and Rhett Butler that the South has lost little if any of its charm. This entry was posted on Friday, April 10th, 2009 at 9:40 am and is filed under Outdoors, Photography, RV Travel. You can follow any responses to this entry through the RSS 2.0 feed. You can leave a response, or trackback from your own site.